How many of you out there hate Brussels Sprouts? I bet you are really looking forward to them on your Thanksgiving table. Every year, I post this recipe to try to get people to eat more Brussels Sprouts. Call me a “Sprout Ambassador” of sorts. The problem is that when you boil them they seem to express more of the sulfurous taste associated with the cabbage family. 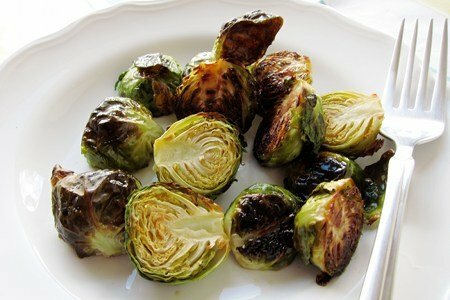 Boiling Brussels Sprouts is a great way to destroy them. Love roasted brussels sprouts! Such a simple and tasty way to eat them!! I love brussel sprouts and just roasted up a batch yesterday. Half the tray was sprouts and the other half cubed butternut squash - another favorite. I also use olive oil with garlic and parsley and then sprinkle the squash with a small amount of parm cheese. yummo! I used to hate brussle sprouts to, then my mom did this! We love grilling, so put some in some aluminum foil, drizzle with red wine vinegar, and grill! So delicious. If you would of told me 10 years ago that I would be eating brussel sprouts I would of told you you were crazy. I love them now. Just roasted some this weekend with califlower. Drizzled reduced balsamic vinegar on after. Delish! Could you use frozen Brussel Sprouts? Brussels Sprouts, butternut squash & pecans, roasted...yummy!!! I'll have to try this recipe. We use a slice or two of bacon and a clove of garlic to sautee LOTS of brussels sprouts. My six year old begs me to buy them when they finally show up in the store! They're on the menu tonight with a huge slab of grilled salmon. What can I say, my kid loves healthy food. Like Amber I want to know if you could use frozen Brussel Sprouts or do they have to be fresh? You can use frozen...just thaw and pat dry! I hated them until I was pressured into trying them at a holiday function. ILOVE THEM ROASTED!!! Now I am the one trying to pursuade others to try them. We toss in dried cranberries for thanksgiving. I know... We will switch to raisins! Brussels Sprouts are a new vegetable in my life, and I can't believe that I've been going years without enjoying them! They get a bad reputation, but taste incredible when roasted. I love them with a little balsamic vinegar too. Heat a non-stick skillet over med-high heat. Add oil. Add sprouts. Toss frequently for 10-15 minutes. Add wine and vinegar. Continue to cook until the liquid had reduced to half (it will be a thin syrup.) Season and serve. Our family loves sprouts this way! I find it easiest to but them in a plastic bag, drizzle in the olive oil and a sprinkle of garlic salt, and shake the bag for good coating. Dump them onto a sprayed cookie sheet, into the 425 oven for 20 minutes....yum. Also, try adding peeled cubes of butternut squash, cut about the same size as the sprouts. The two colors, the orange and lime green look so attractive together, and they both benefit from the same flavors. I like to add a handful of cornmeal which creates an extra layer of crispiness on the outside of the sprouts. Mary Beth - great idea, will have to try that. I just roasted some brussel sprouts this weekend! I added balsamic vinegar, toasted pine nuts and some parmesan. TASTY! Love Love Love Brussel sprouts. Any way they are cooked..even boiled mush! But they are especially yummy roasted like this. Just added them to my Thanksiving meal list. Thanks for the reminder.